It’s almost football season but that doesn’t mean we can’t start talking about basketball. Joining in on the fun over at The Only Colors, here is an early look at the Big Ten conference. 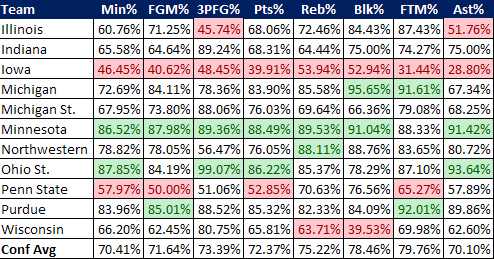 I used a couple posts over at Villanova by the Numbers for some more off-season inspiration and decided to take a look at how much conference teams are returning in various statistical categories. The Only Colors takes a slightly different approach using returning minutes plotted against last year’s Pomeroy rating for each team. VBTN is quick to point out that returning minutes (and other statistics) is not necessarily a great predictor when comparing teams. It tends to be more effective to predict a team’s improvement over the year before. VBTN also looked at three year trends to confirm some of this and noted that John Beilein’s West Virginia teams tend to imr. This isn’t surprising given Beilein’s complicated system and proven track record for steady improvement. We all know that the entire all-conference first team is returning, so the star power will definitely be back next year. The question is beyond the stars, how much does each team bring back? Apparently quite a bit, only one team, Iowa, loses more than half of their scoring and minutes. Comparing the chart of the Big Ten (below) to the Big East is staggering in terms of how much more the Big Ten returns. Top two and bottom two of each statistical category are highlighted. These numbers aren’t guaranteed, I may have missed a transfer or departure but I was mostly working off of this list for transfers. The news here looks pretty good for Michigan, who ranks very high in most of the categories. Michigan returns the most in blocks and free throws made, these are two of the weaknesses of last year’s team. The debate is whether this means Michigan will see a big jump with added experience, or they are stuck with the same struggles on the interior. Three point shooting, shooting, and scoring are all very encouraging. The nucleus of this team returns and with a couple added parts Michigan has the potential to be very good. Michigan’s numbers aren’t necessarily that surprising, we knew this team brings back a lot, however the rest of the numbers from around the conference are pretty appalling. All of the contenders bring back a lot of their teams from last year, this could be a special year in terms of Big Ten talent. Michigan State loses a big chunk of their minutes, defense, and rebounding with Walton, Suton, Gray, and Ibok all moving on. However, it would be pretty foolish to complain about returning around 70% of a team that made it to the Championship game last year. Purdue returns 80% of their production across the board and really doesn’t lose anyone of note besides Calasan and Green. The Baby Boilers are growing up and they should be a consistent top 15 team this year. Minnesota ranks in the top two in 7 of 8 categories, and they return over 85% of their production in every category. With a monster freshmen class headed to the Twin Cities there is plenty to be excited about. Minnesota was the 2nd best rebounding team in the conference, they return the most rebounding, and Trevor Mbakwe and Royce White should only make things better. Ohio State returns everyone but BJ Mullens but they don’t bring any freshmen. The Buckeyes have an odd combo of wing players without a true point guard. I’m not sure if that keeps them from getting over the hump and being a great team but they have experience and talent as well as arguably the best player in the conference, Evan Turner. Illinois loses their defensive stopper (Frazier) in a similar fashion as Michigan (Lee) and Michigan State (Walton) but they have arguably the best one-two punch inside with Davis and Tisdale. Illinois losing a lot of their three point shooting doesn’t worry me because that was not their game plan last year, the assists on the other hand are an issue. Incoming freshmen Brandon Paul and DJ Richardson will provide an influx of talent and athleticism into the backcourt next to Demetri McCamey. Wisconsin is looking at a rebuilding year on paper after losing Krabbenhoft and Landry. I still have a tough time believing they will struggle because Wisconsin seems to always reload regardless of who is on the court. Penn State is probably the biggest loser besides Iowa — losing Cornley, Pringle, and Morrissey — Battle is great but they are going to need some people to step up that weren’t contributors last year. Northwestern returns everyone’s favorite rec league player, Kevin Coble, but they lose Craig Moore. Three point shooting takes a huge hit but Northwestern should continue to improve on the inside with so many pieces returning. Indiana brings in another huge freshmen class but they already lost enough of last year’s class (Story and Williams) that there probably won’t be enough continuity to make huge strides. Iowa fans have nothing to look forward to besides the upcoming football season. The Hawkeyes return the least in every statistical category that I picked out. They weren’t great last year and their incoming class won’t raise many eyebrows either. Who do I have ranked too high? Who is too low? I think Michigan falls somewhere in the Minnesota, Ohio State, Illinois range but I’m having a very tough time differentiating there. Where would you place Michigan in the conference at this point?